Yellowtail and Toro is what and how they roll at Blue Ribbon Sushi. Photos from Brookfield Place Facebook page. 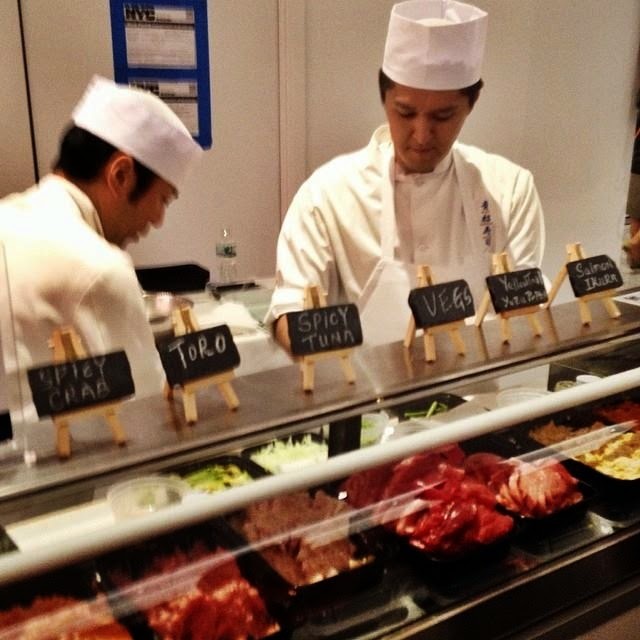 WE feasted on toothsome handrolls of Yellowtail, Toro, Salmon and Spicy Tuna from fave, Blue Ribbon Sushi (sorry Nobu). Another East Village haunt, Mighty Quinn's Barbecue, dispensed succulent pulled pork sandwiches. "Dish" from Dig Inn, Chop't and Olive's at last week's Hudson Eats preview opening. This culinary exercise unfolded last week on the Hudson River waterfront in the shadow of the sleek and gleaming Freedom Tower. Lower Manhattan's Battery Park City was once a culinary wasteland. All that has changed now with Hudson Eats, the 30,000 square foot, approximate 600-seat food court inside the office, shopping and arts & entertainment complex known as Brookfield Place. Last week was the preview. 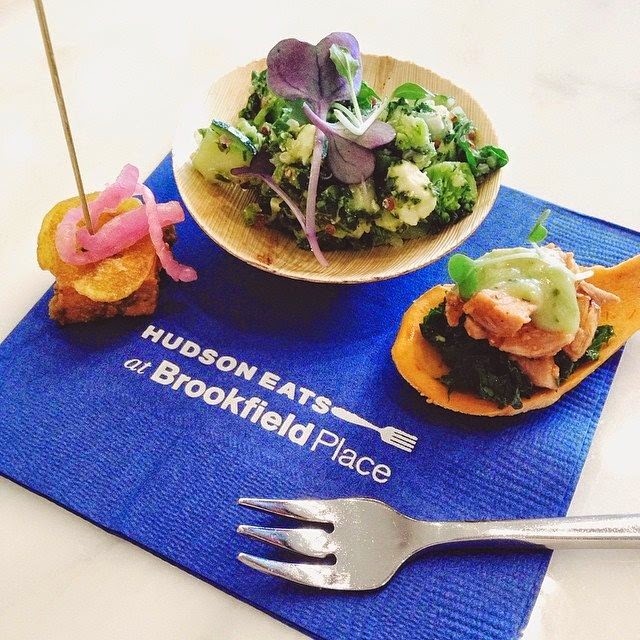 Yesterday, Hudson Eats, boasting a “curated mix of 14 award-winning eateries,” opened to the general public. 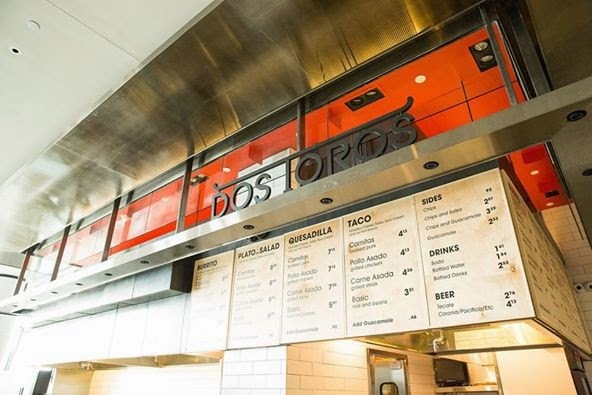 Hungry crowds should leave satisfied from the kitchens of Skinny Pizza (say cheese), Dos Toros (“guac” is good ) and Tartinery (Labne et Saumon Fume c'est délicieux). Sweet tooth carriers would be remiss to leave without something from Sprinkles Cupcakes. The Dark Chocolate, Lemon and Banana are a little piece of heaven. Dos Toros knows its way around guacomole. 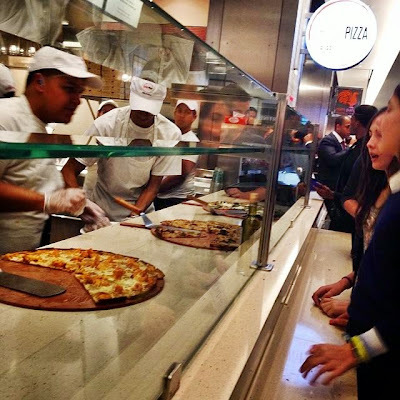 Brookfield Place aspires to be an “upmarket community center” in an underserved neighborhood. Seemingly, hospitality is its middle name. For instance, its arts and entertainment programming includes free events at an outdoor pavilion offering spectacular views of the Hudson. On 12 June, the pavilion will be the setting for an afternoon cultural extravaganza to celebrate the opening of the 2014 FIFA World Cup (http://www.fifa.com/). Among acts on the bill are Nation Beat, Maracatu NY and Raízes do Brasil Capoeira Brooklyn. By this time next year, Brookfield Place will be home to several free-standing eating establishments, as well as, upscale French market, Le District. Skinny Pizza serves up pies with the thinniest of crusts. Elsewhere, according to the rumor mill, a second location of Mario Batali's Eataly may open across the street from Hudson Eats, providing worthy competition and destination dining to this former dead zone. YOURS TRULY contributed to this article. Visit http://www.brookfieldplaceny.com/dining/current and http://www.brookfieldplaceny.com/ to learn more about Hudson Eats and Brookfield Place.